Hey! Ash Wednesday is exactly one week from today! I thought maybe I'd be all organized-like and we could talk a little bit about ideas for observing Lent as a family. It's early this year so if you're like me it's throwing you off BUT since it's February (and February is so hard to like, right?) it gives us something to think about and do. I thought I'd write a little roundup here of some of our Lenten plans and maybe you could share some of yours in the comments? Perhaps that'll give us all the push we need to get things situated before Lent begins so we're not starting off feeling like we're already behind. Because that's no fun and that leads to feeling like we've failed two or three days in when it's barely even started. I want to put right here that the most important thing we can do to live Lent is to live it within the liturgical life of the Church. While extra activities and personal devotions and ideas are awesome and all, the Church has been doing this for centuries and has some pretty good ideas of her own. Attending Mass (especially on the holy days), praying the Divine Office, plain old unfancy almsgiving...sometimes the best and simplest way to have a fruitful Lent is to get back to the roots. But at the same time, living in the spirit of these seasons is also vital to making Christ's message authentic in our own lives. For me, that means that the liturgical year, time redeemed, permeates everything. It's not just an outward observance but an inward movement of the heart. And so our lives change during Lent. It becomes a time of repentance and waiting that infuses even the little moments of every day. I'm going to try not to do too many new things this year and go with what has worked in the past. I sometimes get too many ideas and want to implement all of them but that runs the risk of making me a bit frantic and undercutting much of the point of the season. So doing it simple but well is the way we're going to try to roll this year. The Church has always put an emphasis on three things during Lent: Prayer, Fasting, and Almsgiving. These are meant to be extras that we can do beyond the requirements in order to help us have our hearts in the right place. I like that. It really helps me to focus our Lenten observances in a practical way. Many of us need that lest the idea of letting the season of Lent permeate your life becomes an overwhelming prospect, something that paralyzes rather than frees. I encourage you to think about a way in which each one of these ideas can become a reality in your family during this Lenten season. It may be something you've done every year (when you find something that works, go with it!) or it may be something new to you this year. A few years ago I printed out these beautiful Stations of the Cross cards and laminated them. They've been a huge help for all of us to learn and pray the Stations. The Crown of Thorns - I don't know remember where I got this idea years ago but I know it was a lovely internet find. Using a grapevine wreath we stick in brown painted toothpicks to emulate the crown of thorns. (Some people use salt dough but I prefer the wreath.) For every intentional sacrifice we do for love of Jesus, we take out a thorn and place it in the glass in the center. This year, the crown (which hopefully won't have any thorns left) will be replaced by some sort of homemade coffee cake pastry sugary thank-God-it's-Easter crown type thing for Easter morning. I haven't planned the specifics yet. Each older child will also be encouraged to give up something personal during Lent. Treats are given up as a family. Burying the Alleluia - Sarah posts on it here. We won't actually bury ours as it's frigid cold out in these parts. But we'll make a big crazy scene next Tuesday and get all our alleluias out before Lent. 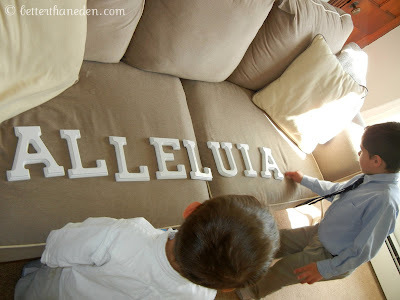 Then we'll wrap up our wooden "Alleluia" letters and they are hidden away. 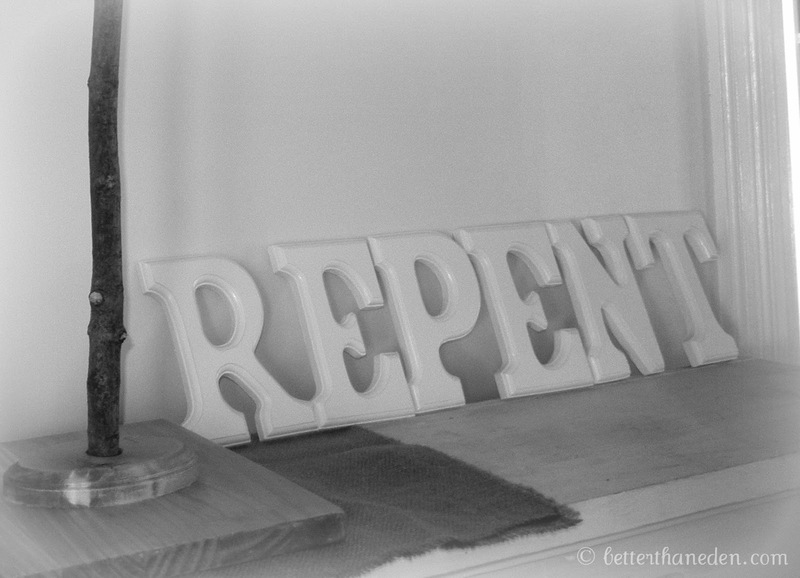 "Repent" becomes the theme for Lent. On Easter morning the boys get to go on an "Alleluia hunt" and find the letters along with their eggs and baskets. I try to simplify the decor around the house during Lent. Dry sticks, burlap, and a bit of purple cloth do their part to remind us of the season. 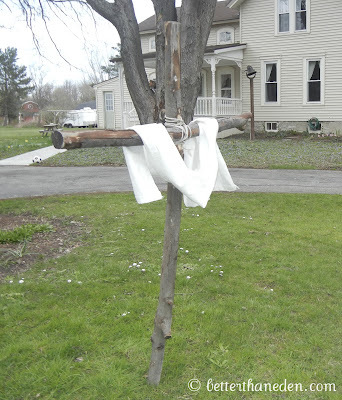 During Holy Week we will complete our Passion Cross, attend the Triduum Liturgies, celebrate our Passover meal, and (try to) keep the house a bit more solemn, especially on Good Friday. When we were young, my mom made sure that Good Friday was kept a solemn day. Between noon and 3, especially, there was no noise allowed. We were allowed to read but only books pertinent to the day. I've carried that into our home as well. So, there's the general outline for our family Lent. Each of us will likely be doing a few more things on a personal level, too. I'm still hoping to find the right book to read and will probably limit my internet time a bit. 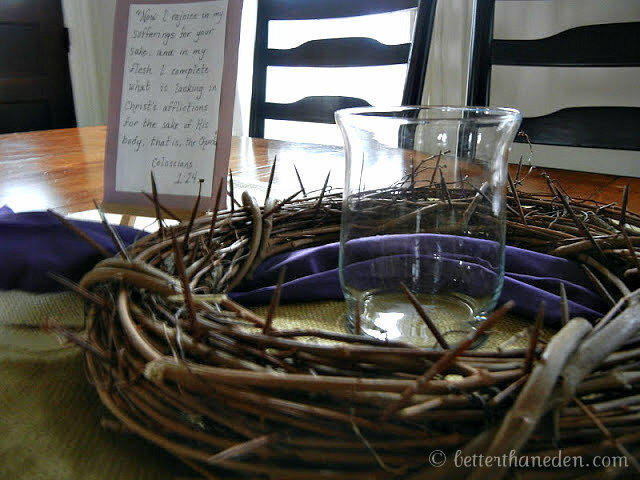 How do you observe Lent as a family and with your children? What's worked for you? Are you planning anything new this year? Share with us! This is so inspiring- I look forward to the lenten season every year but I never seem to follow through with my plans for our family. I love the ornaments- this would be enjoyed by our entire family. 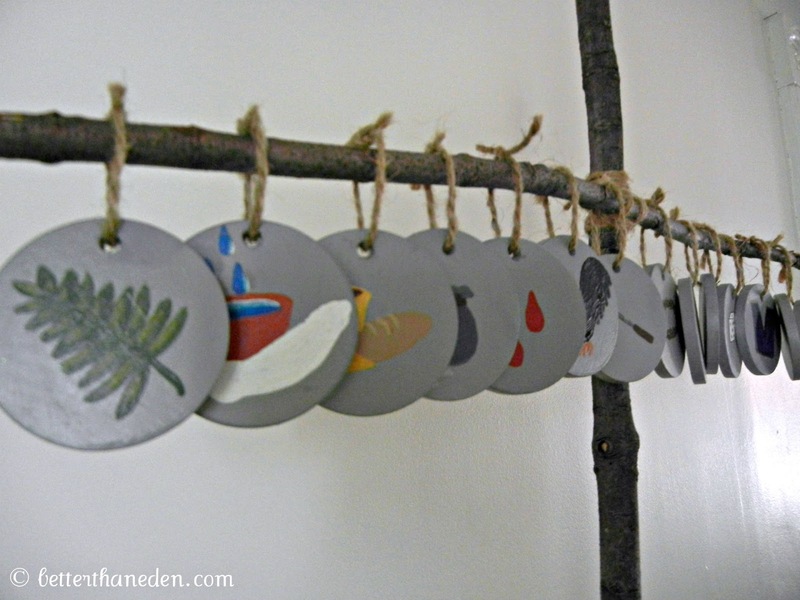 We also use Ann Voskamp's Trail to the Tree devotional and her son Caleb's wooden candle wreath. We light a candle each night, after supper and read the devotion. It is an amazing experience. Oh, that candle wreath! I've seen it before but have never gotten around to really looking into it! It's a really neat idea. Sort of like a Lenten version of the Advent wreath. I may have to check it out... Thanks, Cary! I loved this post, so many great ideas! Lent definitely snuck up on me this year...just realized how close it was when I was flipping in my calendar! I know, right?! Didn't we just finish Christmas? At least around here, we're really starting to need Lent, though, so I guess now is a good a time as any! I'm very excited to have the cradle to cross wreath to use for the first time this year. Last year I used the book A Place at the Table to guide me through the lenten season and I'm looking forward to using it again. I'm visiting from the Little Holydays linkup, and I'd love to know what you end up reading...I just haven't quite hit on the right thing yet, personally. Thanks for sharing your plans!